Wearing a watch from the Garmin Fenix 5 series of sport watches is like strapping a computer to your wrist. The functionality and price tag certainly have similarities to your laptop. 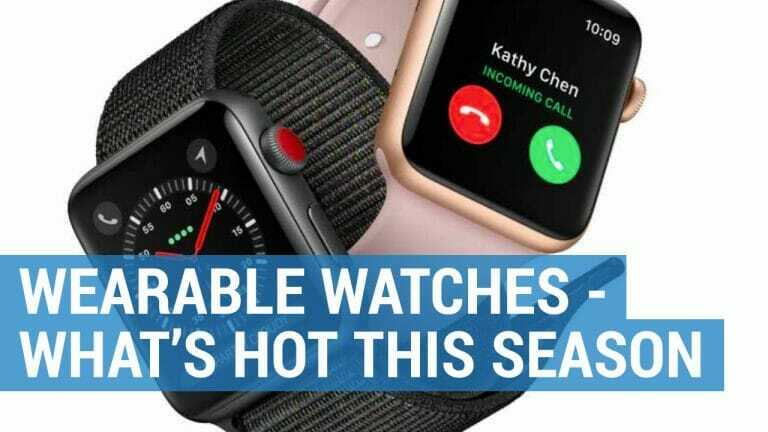 However, the streamlined size and ruggedness make these fitness watches ideal for tracking your fitness levels whether you’re running a marathon, paddle boarding, hiking the Rockies or working on your golf game. The Garmin Fenix 5 series is made for more than the typical gym-goer. It’s designed with the adventurer in mind. Anyone can wear this watch, but its waterproof exterior, GPS capabilities and options for a Sapphire lens make it ideal for the outdoor sports enthusiast. We’ve taken some time to get to know the three options in the Fenix 5 series so that we can tell you what we really think about their features and benefits. Before we get into detailing each model, we wanted to let you know something right off the bat: These watches don’t have a touch screen. While the ease of a touch screen is a perk of some lower-end watches, the Fenix 5 series is made for serious outdoor adventures. Touching a screen while wearing gloves or manoeuvring through wet weather isn’t going to get you very far. For that reason, Garmin has made these watches navigable with easy-to-use buttons on the outer edge of the face. Speaking of the screen, its high-contrast display is easy to read in any type of light. That means that if you’re exploring in low light, you’ll be able to check your specs just as easily as if you’re training in bright sunlight. You don’t want to have to spend time fiddling with your watch when you’re focusing on your sport. 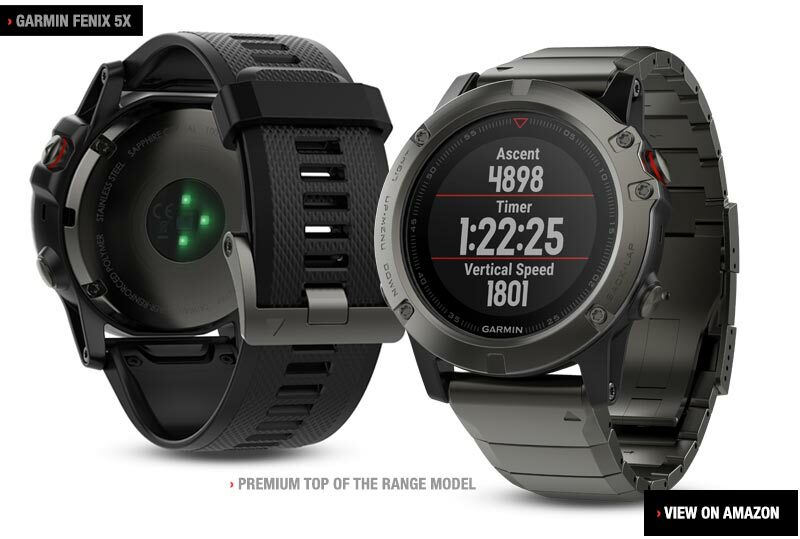 Some of the standout features of the Fenix 5 series is that it it’s Wi-Fi enabled for automatic activity uploads directly to Garmin Connect when connected to wireless networks. 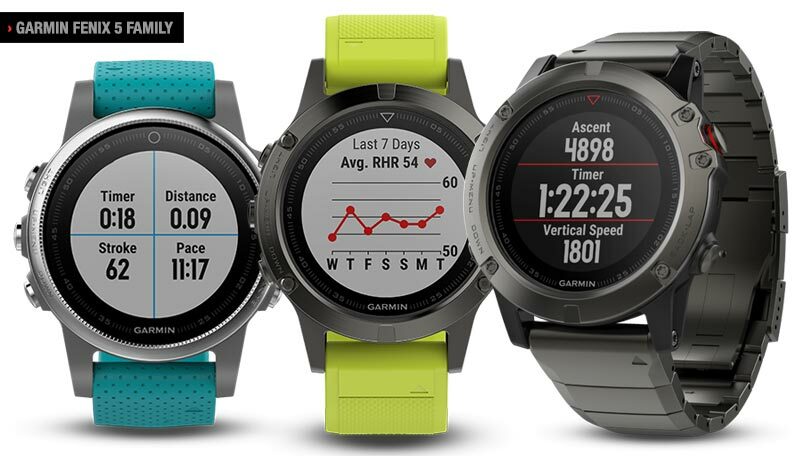 Garmin has developed it’s Elevate wrist heart rate monitor, and we should see improved accuracy in comparison to the Fenix 3 HR models. The monitor sits on a durable stainless steel backing and is fully integrated into the back of the watch. Some other features that all of the watches include are an altimeter, digital compass, pre-loaded activity apps for skiing, hiking, climbing, cycling, running/walking, swimming, paddling and golf. You can customize the look of your Fenix 5 watch with easily interchangeable QuickFit bands. A lever on the wrist side of the band allows you to remove it in one motion. The bands come in a variety of silicone, leather and stainless steel options. Garmin Fenix 5 and Fenix 5s Sapphire watches come with a second set of QuickFit bands in the box. Data that you record on the watch, such as heart rate, is automatically saved on Garmin Connect. You can also customize your watch with widgets, data fields and apps from Connect IQ. These features make the Garmin Fenix 5 series much more than a simple running watch. It may be the best Garmin GPS sports watch 2017. We assume the S stands for “small, or slimline” as this watch is sleeker than the others. With its 42mm watch face body, this watch is less obtrusive than its predecessors and family members. It’s marketed for women, but not because it’s dainty. The Fenix 5S watch is simply smaller and lighter than many others. It fits better on more petite wrists, especially when you need the use of your hands to focus on your sport. The Garmin Fenix 5S still has a tough-looking design, with its brushed steel casing and durable straps. You have the option to purchase the Sapphire lens, which provides extra durability in rough conditions. The Sapphire option has Wi-Fi included for easier uploading and downloading. Who Should Buy Garmin Fenix 5S And Why? If you’re ready to step up from the basic running watch or activity tracker, this might be an ideal next step. People who have used a GPS or fitness watch in the past will be able to navigate this one with ease and appreciate the plethora of downloadable widgets and options. This watch is made for those people who might have put off purchasing a sports watch because they’re too bulky or seem to sporty. Female athletes should find this design appealing for its smaller size and improved styling. The Fenix 5S is also useful for people who are serious about analyzing sports and training information without the inconvenience of pulling out a smartphone. The watch keeps track of so much data automatically that you don’t have to think about it until you’re ready to review your stats. The GPS functionality helps the product keep track of things like pace and distance when you’re moving. The additional GLONASS satellite reception helps you access location data better when you’re off the beaten path. The Fenix 5 watch is approximately the same size as the Fenix 3 HR. It’s larger than the Fenix 5S but doesn’t have the bulk of the 5X. It’s still compact for those who don’t want the heft of a larger sports watch. This version is expected to be the best seller from the range. You can change out the band on the Fenix 5, but it doesn’t have the suede option that the 5S has. We think that this makes it a little more rugged in the water or on the trail. However, it may not blend in to your everyday life as easily as the smaller model. Who Should Buy The Fenix 5 And Why? Athletes who are seeking an upgrade to track more details of their sport should appreciate this watch. 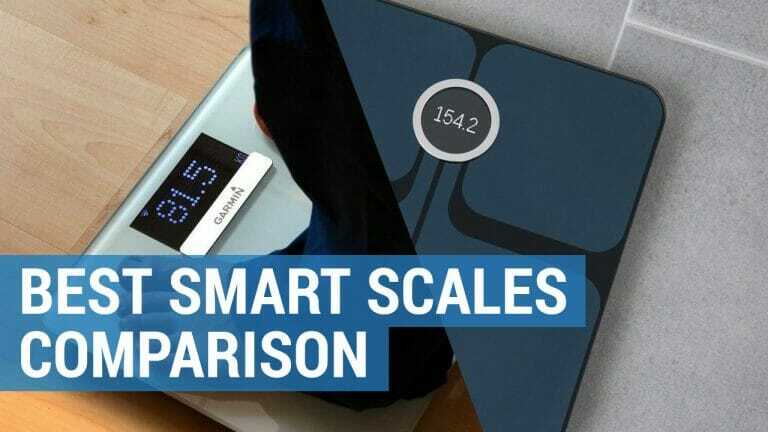 If you know that you want the enhanced ability to monitor a specific sport, you can swap out a generic running watch or activity tracker for this model. If you normally exercise indoors, this watch is probably still worth it. However, the enhanced GPS capabilities and mapping support make it just as appropriate for those who spend time outdoors. If mapping is an important for your activities, then the Fenix 5X might be the way to go. You’ll have confidence that it won’t run out of batteries when you’re deep in the woods, and you can point the watch anywhere and find out information like distance and altitude. If you’re a swimmer, you might not need the added benefits of mapping. Plus, the optical heart rate monitor isn’t always accurate in the water. However, land explorers might find the watch’s mapping abilities beneficial. This watch is the superstar of the series. 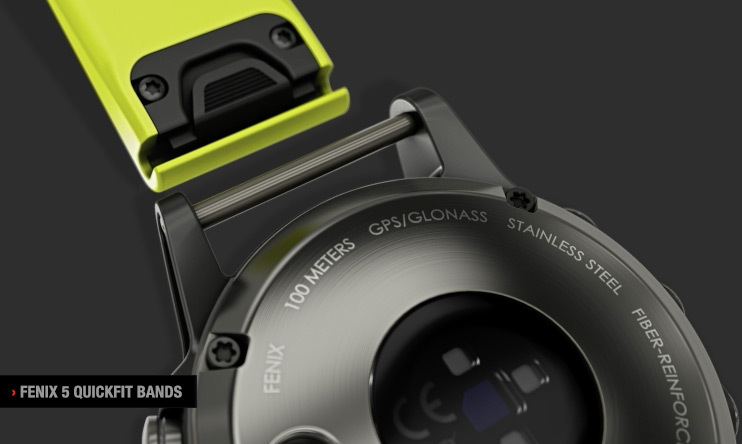 Some of the features that are optional in the Fenix 5 and 5S are automatically included in the Fenix 5X. How Does Fenix 5 Compare With The Garmin Fenix 3 HR? The Fenix 3 HR might have been one of the best multisport watches from 2016, but the Fenix 5 expanded on its best features. The Fenix 5 has a sleeker, more everyday style than the Fenix 3 HR. Even the huge 5X has the sophistication of a traditional watch without giving up the ruggedness of a sports watch. The screen has the ability to display more vivid colors. The Fenix 5 series has a 64-color screen compared to the 16-color display on the Fenix 3. Although this may not make or break your decision, it does enhance your experience. The Fenix 5’s screen layout is cleaner than that of the Fenix 3. It has been optimized for a more efficient user experience, with menus consolidated for ease of access. The back of the watch sits closer to your wrist. The optical HR feature added thickness to the Fenix 3 HR, but it’s hardly noticeable on the Fenix 5 series. The Fenix 5 has enhanced features for more sports. It now works with ANT+ Varia bike lights and bike radar. You can also choose mountain biking, treadmill, indoor track, ski and snowboard. The Fenix 3 doesn’t have all of these sports options. On the older model, you can’t separate treadmill from indoor track or skiing from snowboard. Like the Fenix 5 series, Suunto Ambit 3 has different styles that feature different options for functionality, size and style. It also offers a smaller, sleeker watch that’s marketed to women. Still, Garmin’s Fenix 5S is smaller and thinner. What’s different than the Garmin Fenix 5? Heat maps allow you to plan your exercise path based on popular routes. A recovery test gives an added measure of your fitness level. A sleep recovery test tells you how well you recover from sleep when you wake up in the morning. Garmin’s Fenix 5 screen has a higher resolution, and the battery lasts longer. 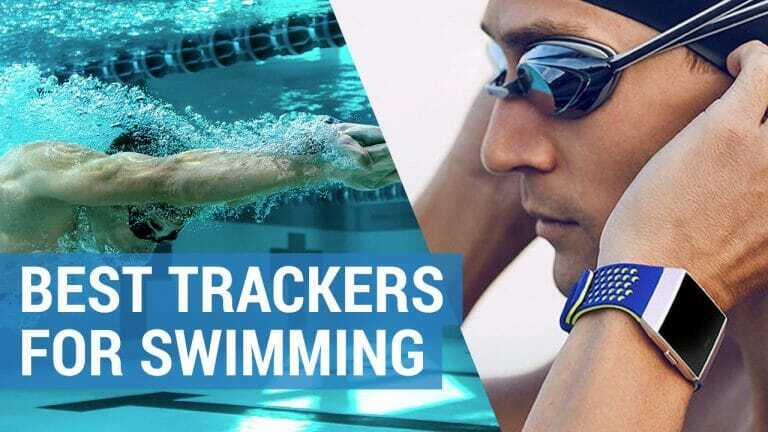 Garmin also has more comprehensive activity tracking features, advanced running features and improved swimming metrics. 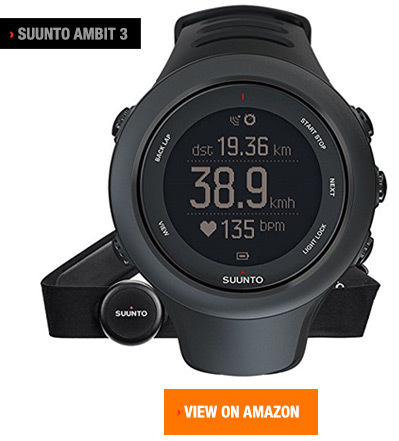 With the Suunto Ambit 3, you have to decide whether you want the one that’s optimized for altitude, running or multi-sport. The Garmin includes all of the sports in one watch. All you have to decide is which size you’d prefer. However, the Ambit 3 is significantly less expensive, so you also have to decide how much you want to spend. Suunto Spartan Ultra is perhaps more comparable than the Ambit 3 to the Fenix 5 series. The Spartan Ultra is truly a multi-sport watch. It has expertise and support for more than 80 sports. The Movescount site and app is getting upgraded with the development of this watch. Suunto Movescount lets you compare yourself with your peers. This can help you stay motivated and match your performance with others training toward a similar goal. The Suunto Spartan Ultra has a touch screen, a feature that the Garmin doesn’t have. The screen can be locked if you don’t want to use it, and three navigation buttons make it easy to use the watch even when you’re exercising or in water. 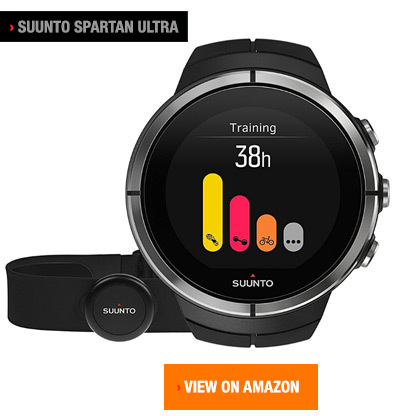 What don’t you get with the Suunto Spartan Ultra? The smaller size. Although there are several models in the Spartan series, they’re all based on the same base styling and size. 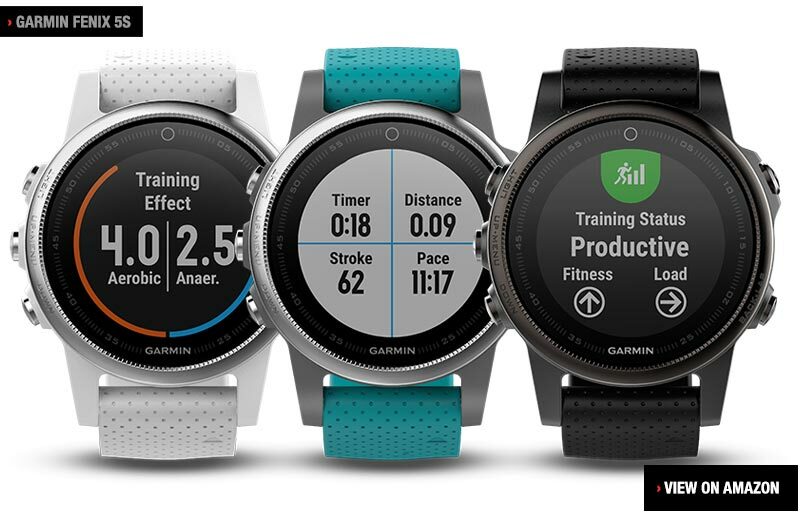 Garmin also has more running and swimming features, more connectivity and more sensors. Polar isn’t in quite the same boat as the Fenix 5 series. It’s called a multi-sport watch. However, the Polar V800 is focused more toward beginning runners. It’s only water resistant, so you can’t use it to track your swimming activity. The Garmin still has more advanced running features. 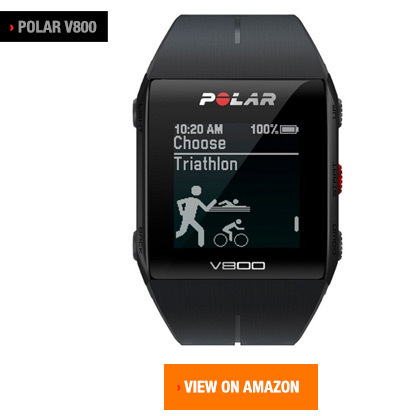 The Polar V800 has several tests and training suggestions that give you information about your current condition and what to expect as your heart rate increases. If you’re paying more than $500 for a sports watch, you might already want to be aware of that type of information. The features of the Fenix 5 are more comprehensive across the board. The display is in color, and it’s quite advanced compared to the Polar V800. You can search for maps on the Polar Flow Explore app, but they don’t show up on the watch itself. Text messages and calendar reminders do show up, however. This watch has the ability to provide smart notifications that the Garmin also has. 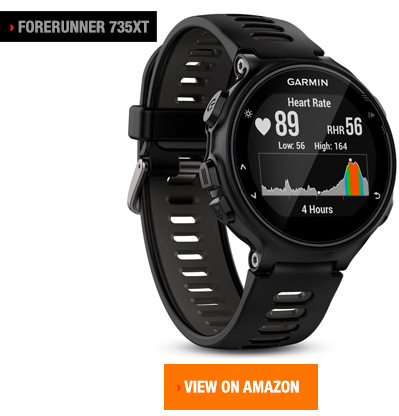 The Garmin Forerunner 735XT offers running, cycling and swimming tracking dynamics. You have access to Connect IQ, so you can change out your watch face. The color screen and ability to get smart notifications match up with the Fenix 5. The style is also a little bit sleeker than some other sports watches. However, it only comes in one size. The quality of the materials is a step down from the Fenix 5 series. The Fenix 5 has a longer battery life than the Forerunner 735XT. 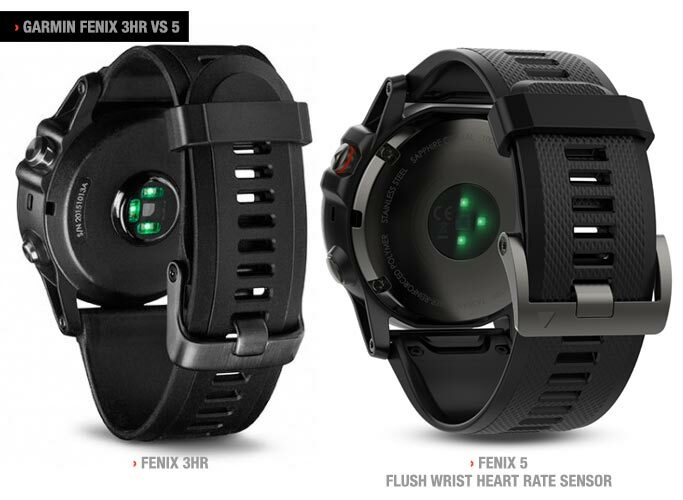 The Fenix 5 series also has more sensors and additional sports profiles. Suunto Traverse has been on the market for several years. It was one of the first sports watches to have a traditional look for everyday use. Still, the Fenix 5 series offers a smaller sized watch with a larger display and better resolution. It has features that are ideal for the outdoor enthusiast, including sunrise and sunset times, weather change predictors and storm alarms. The backlight has a flashlight mode that can help you locate your necessities. In certain modes, the Suunto Traverse will give you 100 hours of battery life. However, it doesn’t have the additional sports profiles, sensor connectivity and smart apps that the Fenix 5 series has. Suunto Kailash features premium grade materials. Space grade titanium is impressive. It also has the same Sapphire lens that the Fenix 5 series features. With its high price and solid quality, you might expect more than its monochrome display. 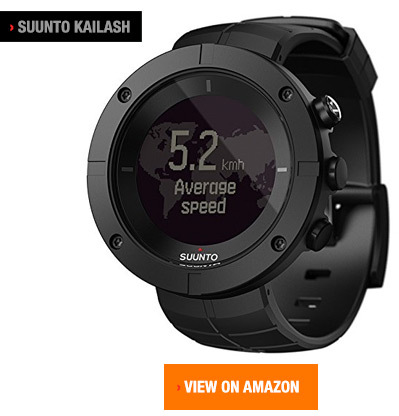 The Suunto Kailash is marketed to the traveler and the adventurer. It is perhaps better geared to the explorer than the athlete. The materials are durable, but the styling is uber-sophisticated. The 7R Logbook feature allows you to record summaries of your travels to different cities and countries. As for its activity tracking features, it works like a basic run tracker. 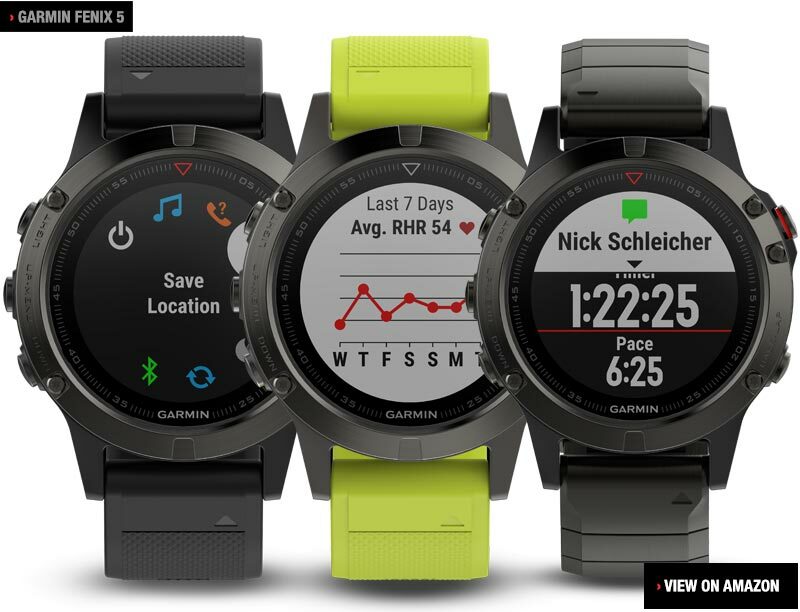 The Fenix 5 series offers more sports options and better sensor connectivity and apps. 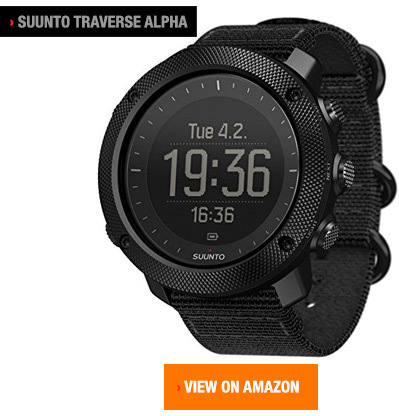 Suunto Traverse Alpha is geared to the outdoorsman. This watch has fishing and hunting features, a moon phase calendar, shot detection and a red backlight for use at night. You can plan routes for hunting and camping trips. You can save the paths that you’ve already taken. However, this watch doesn’t have the advanced mapping capabilities of the Fenix 5X. Fenix 5 is smaller and lighter than the Suunto Traverse Alpha. It also features a crisper, more colorful display. Plus, it’s geared toward a variety of sports and activity. The Suunto Traverse Alpha seems limited if you’re not into hunting and fishing. The Fenix 5 series might be the best GPS running watch 2017. However, its benefits don’t stop at tracking running activity. Garmin Fenix 5 is remarkably versatile. We think it should be. After all, it costs what many may consider a hefty chunk of money. However, we never felt that it felt short of its value. 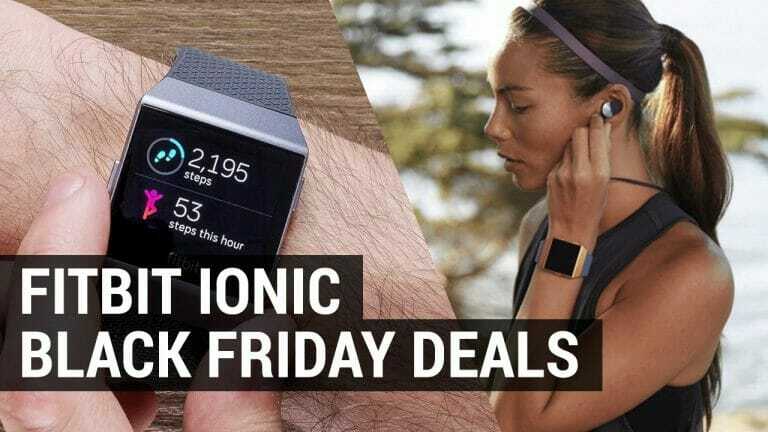 It’s ideal for tracking data for so many types of sports that you don’t have to worry about purchasing a specific watch for your favorite activity. If you participate in multiple sports or change your interests down the road, you’ll still be able to use this watch. Although it has so many features, it’s straightforward to use. If you can use a smart phone, you can use this watch. You customize the watch face and select the apps that you want at your fingertips. You can read the full-color display easily in any light, which is important when you’re on the move. Although this watch doesn’t have a touch screen, you won’t miss it. Its features and connectivity options more than make up for it. We love it!